RESTAURANT TOWN HEY GUYS, WHAT’S COOKING? WELL, WHATEVER YOU DECIDE! 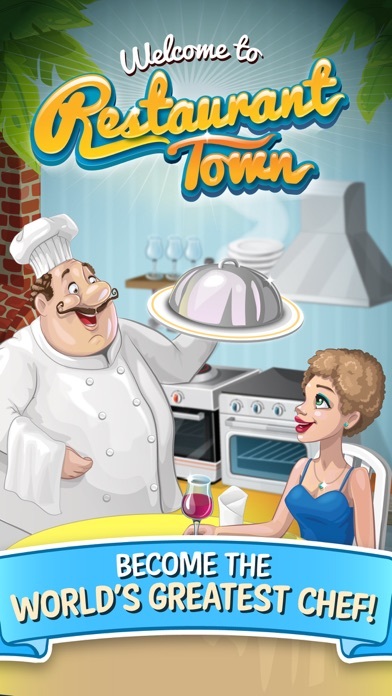 Restaurant Town needs a new Master Chef to spice things up! Can you take the heat? Cook and prepare dozens of hearty breakfasts, nourishing lunches, luxurious dinners and even sumptuous desserts! Start with crowd pleasers like pizza or grilled cheese and progress to more extravagant foods for delicate palates that only specialised international chefs can prepare! The better your marvellous meals, the happier your customers will be! Invest in your restaurant - refresh your menu often, purchase new appliances, display your edible masterpieces, serve them with panache and decorate the place with hundreds of cool, fancy and fun items. There may be “rest” in “restaurant”, but not for true entrepreneurs and masters of their cooking craft! 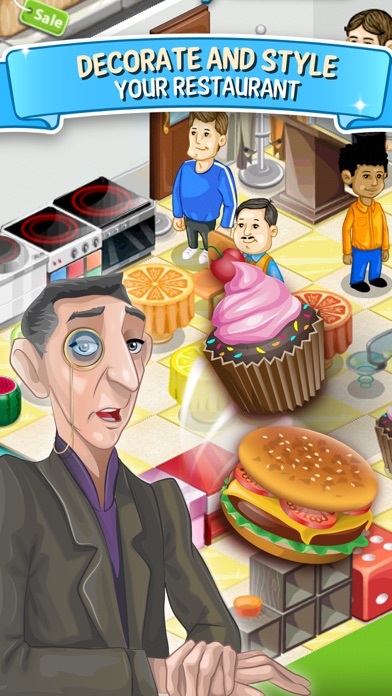 Participate in interesting and challenging quests, experiment with different foods, keep the place clean and you’ll be the talk of Restaurant Town in no time! 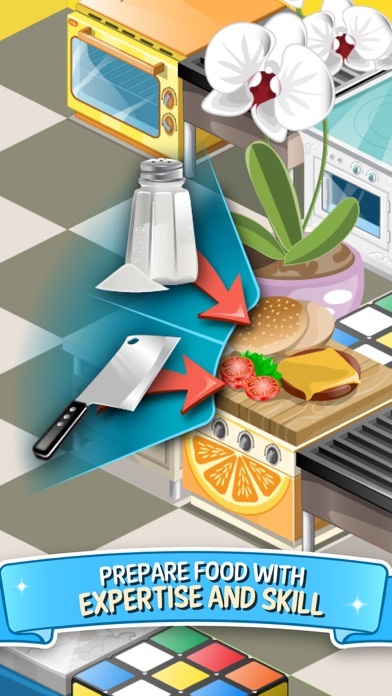 Buy wallpapers, windows and doors, tables and chairs, employ better chefs with special skills, add more space to your restaurant and even more floors once you really - as they say - start cooking with gas! Then connect with your friends via Facebook or Game Center, share your accomplishments, send them gifts or write on their walls! MAKE YOUR RESTAURANT THE BEST AROUND! Hello, Developers This game use to load up. Now when it seems that it is loading. The screen goes black. Hello, Developers The pop up game advertisements. Are a nuance. So please stop the game advertisement commercials. Because I can’t play any of your cooking game apps. When the pop-up commercials happen. It stops me from resuming the food order . Before it expires. I enjoy this game. I play as I watch TV and my business grows before I know it. I take special interests in designing my restaurant. Why give the option to sync with Facebook if it’s not going to allow the user to save progress so this means that if anything happens to the device that I’m playing the game on and I have to switch devices then I will lose everything. Then the items on the market are to pricy. 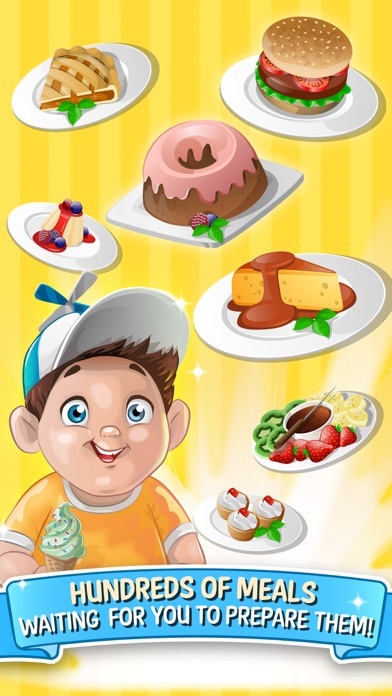 If you place the same food item on 2 different serving tables once space is needed to set a new food item down the game doesn’t even group it together so that the food can automatically transfer to on serving table I will be deleting this game as it seems like the creators don’t seem to care about the issues in the game. Just like the previous review stated this is a take it or leave it type of game! This game is loads of fun. The only thing so far that needs improvement is when you purchase tiles and floors and you decide to replace them, they are not stored and you lose them.